Kappana’s Theatre (Angala) is a small theatre, performance and exhibition space perfect for intimate gatherings heavy on culture. 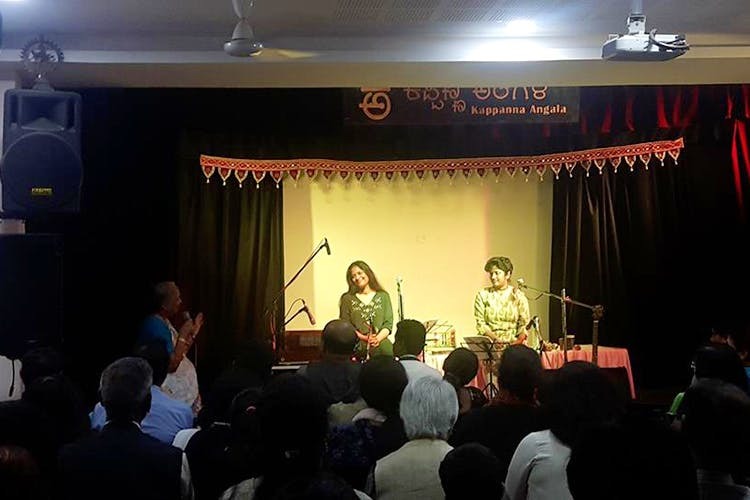 For a slice of culture pie or if you want to put up an intimate performance Kappanas Angala in JP Nagar is your go to if you can’t afford to (or don’t need a space similar) book out Rangashankara at the other end of the road. Seating around 150 people at most, the unassuming theatre is great for those giant fam jams with performances, events for kids, workshops or intimate gatherings (like reunions, small appreciation ceremonies or cultural events). Being a small space, most of the events that take place there, should you feel like attending, are live (classical and culturally relevant) music events, dance recitals, or small play productions. They also serve as a space for art and craft workshops, story telling for kids and art exhibitions. The pricing depends entirely on the nature of the event and the amount of time you’re booking the place out, if you’re hosting one. The cost of attending events at the theatre depend on the organisers. As they’re a small theatre, tickets are to be bought at the gate. They don’t have a dedicated parking space, and since the area is largely residential, it could be a bit of a problem getting parking nearby.